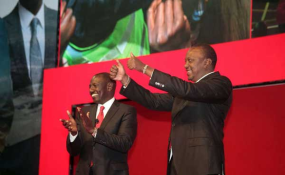 President Uhuru Kenyatta (right) and his Deputy William Ruto (file photo). Kalenjin elders on Wednesday said the 2022 election pact between President Uhuru Kenyatta and his deputy, Mr William Ruto, must be respected and protected. They said Mr Ruto's presidential bid in the next General Election should be supported by all, including the Head of State. The elders, who got the backing of a number of elected leaders, said they were getting ready to launch a campaign for the DP's presidential bid amid an expected onslaught from Kanu, which also draws its base from the Rift Valley. They petitioned President Kenyatta to throw his weight behind the DP's bid to strengthen his candidature. "It goes without saying that in 2013, Myoot elders agreed to support Uhuru Kenyatta and in return, he should back Mr Ruto when it comes to his quest for the presidency," said Major (rtd) John Seii, the chairman of Myoot, a grouping of senior Kalenjin elders drawn from the community's various sub-tribes. He added: "We are already in touch with elders from the Gema and Luo communities, among other ethnic groups, to support our cause." The sentiments were echoed by another group calling itself the Kalenjin Council of Elders, who said Mr Ruto should be rewarded for being loyal to President Kenyatta. They challenged their counterparts from central Kenya to declare their stand on the DP's 2022 presidential bid. "As a community, we are certain that our counterparts from central Kenya owe us politically, having supported one of their own in the last two elections. It is time they pay back by backing our son to be the next president," said Mr James Lukwo, the elders' chairperson. The DP has in the past maintained that no community owes him any political support even as he consolidates backing to succeed President Kenyatta. The Kalenjin elders yesterday called on Rift Valley leaders to be united and strategise on how to boost Mr Ruto's political support. "We want our leaders to avoid wrangles that might scuttle our son's presidential ambition in 2022," said Mr Benjamin Kitur, an elder from Nandi. The elders disclosed plans to hold a series of meetings to popularise Mr Ruto's candidature among other ethnic communities. "Charity begins at home and we shall be holding meetings with our people before reaching out to other communities," said Maj (rtd) Seii. Nandi Senator Samson Cherargei said MCAs and opinion leaders would be enlisted to popularise Mr Ruto's bid. "We have drawn up an inclusive plan to consolidate support for the DP and those opposed to his candidature are spoilers," said Mr Cherargei. He termed the perceived Jubilee Party rebels from Rift Valley as betrayers, warning that they had dug their own political graves. "It amounts to political suicide for such legislators to support leaders from other political parties. It will turn tragic for them," said the senator. Nandi Hills MP Alfred Keter has rubbed many of Mr Ruto's supporters the wrong way. He has asked Mr Ruto to abandon his corrupt allies and sycophants if he wants to succeed President Kenyatta. "I want to tell the Deputy President the truth; those purporting to be supporting him are just with him for their stomachs," said Mr Keter in recent interview. This comes as a section of Jubilee legislators are calling for former Gatanga MP Peter Kenneth to be the DP's running mate in 2022. The leaders, mainly from Mt Kenya and Rift Valley regions, dismissed claims of an imminent split in the party over President Kenyatta's succession. But they admitted that the party was facing "challenges" arising from the handshake between President Kenyatta and ODM leader Raila Odinga.